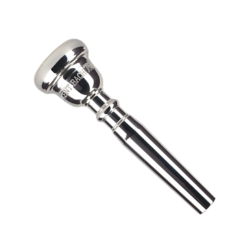 Bach Artisan Trumpet Mouthpieces reflect the earliest of the Vincent Bach mouthpieces in look, tone, and response. The external design of the Artisan trumpet mouthpiece is based on the early 1920’s design, and each mouthpiece has a specially selected throat and backbore to compliment the playing characteristics of its era. The Artisan 5C produces a lively and rich tone. It features a softer outer edge for quick response.